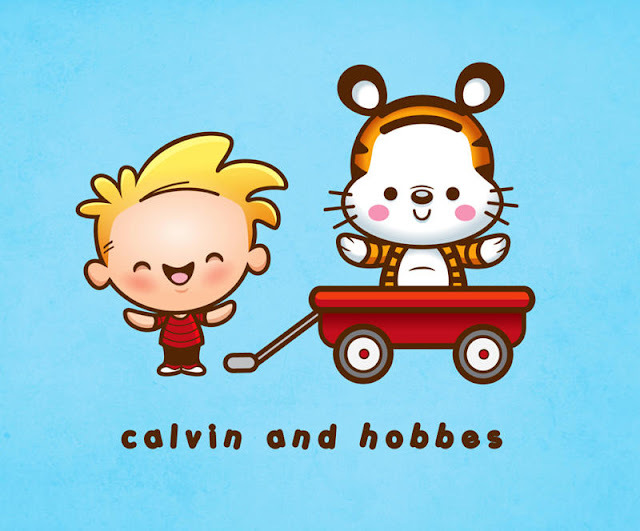 Is there a link to see the other Calvin and Hobbes Art Contest entries? MUST SEE NOW! Oh ... my ... god! Those are some of the greatest photos EVER! Thanks for the link. And as you just mentioned B.A.D. day ... I am having a particularly crappy day, but those photos (both, abandoned buildings and cute thingies) made me smile for the first time today. Thank you so very much for that. Consider yourself hugged. I only own 1 room as of the moment, and the generic geek theme runs deep. We have a mix of gaming posters, no less than 14 (!!) dragon statues, and various preserved animals / animals parts (glass case with a scorpion anyone? no? how about a preserved alligator head?). Oh and of course my beloved pet snake Samantha’s tank in the middle. OMG, the cute factor. I'm dying of squee. The wall of drawers: WANT. I'll thumb wrestle you for them! "John and I are playing with blow torches *right now! *" What?! That falls under the category of "Five things NOT TO DO" for me. Especially the "playing" part. "Blow torches dangerous: NO TOUCH." That should be emblazoned upon my forehead. You're a braver girl than I, Gungette Din. My kitchen has a "theme" or as my son puts it, "an estate sale waiting to happen". It all started with the kitschy KitKat clock with those mesmerizing back and forth eyes. Before I knew what possessed me, I had amassed every big-eyed, pitty kitty print by Gig and my walls are no more. And then the kitschy kat knick knacks followed. If kitty looks too realistic, it doesn't belong. Ya'll make sure to check out my estate sale when I'm gone. DS says everything will be a quarter! That's enough to keep me around. LOL. I had the same immediate thought about those drawers. Alas, I have to pack as otherwise I'd be spending tons of time exploring those sites. Oh, and I tend to go more for color / texture groupings rather than style groupings. 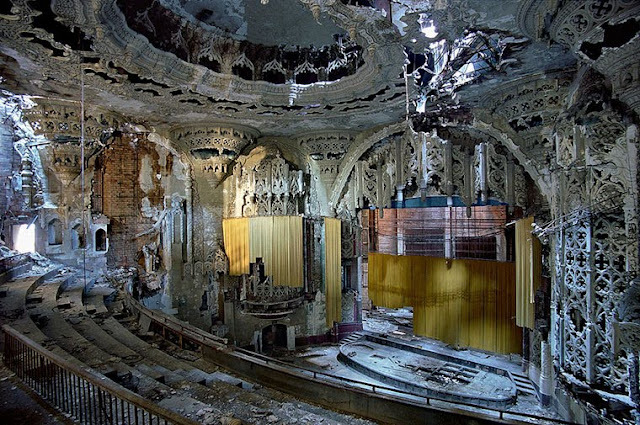 I can't believe that's a theater in Detroit! When I first saw it I thought that maybe it would have been somewhere in Europe or something. I would have liked to see that place in its splendor too. The decay pictures are awesome! thanks for sharing. hope you are having a good day. Check out the jawas poster at somuchpun. It is awesome. 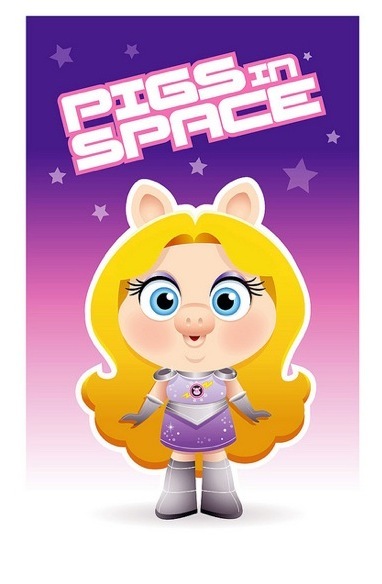 Oh, and piiiigs innnnn spaaaaaace was one of my favorite Muppet sketches! I love the Miss Piggy! As far as my/our (hubby included I guess) tastes in art, we're eclectic so there's no consistency. My husband does a lot of travel for work and we try to get in as much as we can as a family, we pick up things along the way. For example, in our living room/dinning area we have a reclaimed piano piece turned into a large candle wall sconce, an Italian Mardi Gras mask, Narsil, Native American pottery, antique Muslim prayer rug, a Van Gogh and Monet print. Upstairs in the loft area are our college diplomas, a 60-year old map from our home town, multiple Star Wars "toys", antique Okinawan dogs, a Thai zodiac calendar, and lots of books. I've been keeping the ridiculously nerdy things in my bedroom. (Yes, I own a Dark Crystal movie poster.) But the living room is decorated with Native Eskimo art. Mostly because that's where I am, and people come to the door selling it. It wasn't so much an artistic choice, as, really, what else was I going to do with all the coolness? The artwork in my rooms are organized by what matches the furniture (mostly hand-me-downs. Kind of lame, but I like what we have ended up with for the most part and we haven't had to spend a lot of money. We have a lot of family pictures, and a few nice prints. One of the B&B where we stayed on our honeymoon, and I have one of these too: http://michaelwhelan.com/catalog/product_info.php?products_id=20&osCsid=d1599f02b4fff53e32903789ffde9379. It's from my favorite book cover EVER! You've definitely inspired me to redecorate a bit though. I have an idea of what I want it to look like; I just need to find the right stuff first! 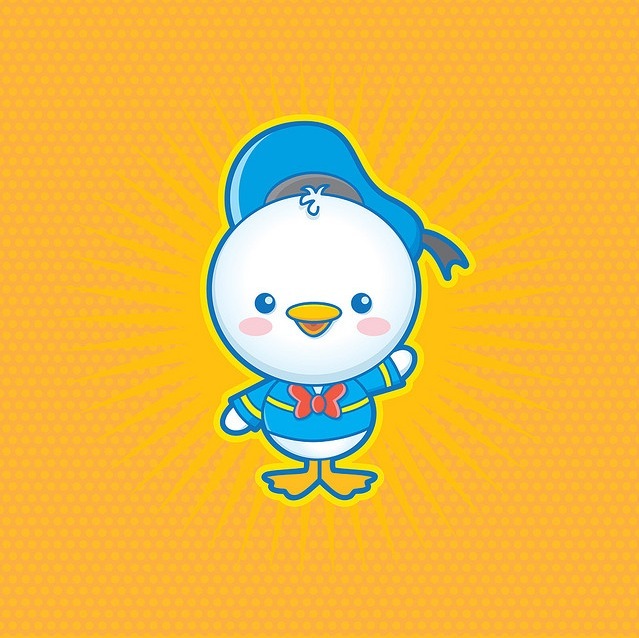 I want to buy Jerrod Maruyama's illustrations. I went through his fliker page and I love them all! Any ideas where to get his prints, or if they are on t-shirts? I love the pictures...and I love taking pictures in abandoned buildings, but most of all, they make me sad. What stories do these buildings have? Just think of how many things happened with those drawers, how many memories were made in the theater. I want to go in and take care of the places, mend them. And as for art, I've got everything from a vintage pepsi sign (yes, it's about 4 feet by 3 feet), Degas prints, records, maps, and pictures of sheep up just in the room I'm in right now. I figure, if I love it, it must go together. 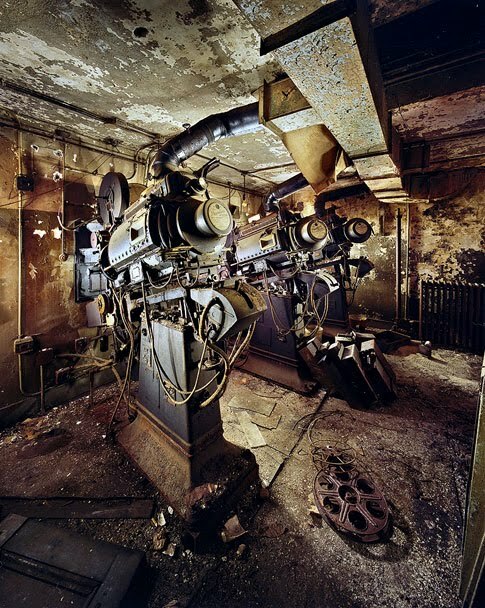 Those abandoned building photos had me totally drooling. 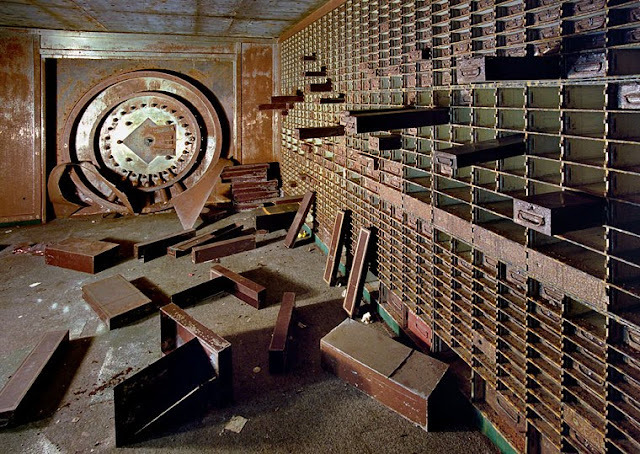 The bank vault picture is amazing. 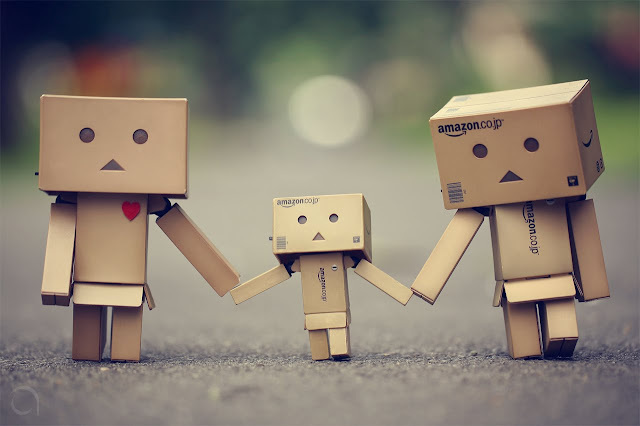 I want a cardboard robot now, and a chibi Miss Piggy. As far as art goes, I'm right there with you on the eclectic. I like everything from National Geographic photography to Victorian fashion plates to Steamboat Willie-era Disney prints. And since you're such a fan of steampunk, it would be nice if I could get your thoughts on a series I did over here I took different comic/movie/anime characters and translate them to the steampunk version of the South. It was alot of fun & sold fairly well at the Jackson Comic-con. I know you like geek crafts so enjoy! Here's my Calvin & Hobbes fan art...I made him for my son's 9th birthday. I don't think it qualifies for the contest, but thought you might like it... he's almost lifesize, and totally cute and fun. He also gives really great hugs! Ohhhh °_° you always have the best links ever... fabulous photos!!! thanks! NO!!! I love decay as much as the next person but the photos of the drawers and the theatre make me want to cry. Why oh why do people allow this to happen. I want to save them both. I found this link on BoingBoing and thought of you and steampunk. Although I'm not exactly sure what steampunk really is - this sort of made me think of it....Love your blogs!! I try to keep the same kind of art in the same room to create a theme; however, that doesn't happen! In the office I have vintage print of a woman playing the piano, Stitch reading a book, etc. Living room isn't much better...prints from Italy and Pixar posters! Oh well! I love it! You should browse thru the fabulous ruins of detroit. O....M...G! You could die from so much cuteness! I want all those pics! I can see a lot of time being sucked up looking at every one of them over and over. Thanks for the great links Jen! I have eclectic taste in art too I try to mix things but so that the look like they belong together. I had to stop myself from being too into color groups; now I let things settle together and see how it works....Now off to Maruyama's page again! speaking of the ruins in detroit, palladium did a great documentary on the 'new' detroit hosted by the lovely johnny knoxville. it shows what the next generation is doing to get detroit back on the map... super excellent. If Steampunk had a soundtrack it would be Toccata and Fugue in D Minor by Bach. Just listen to it and you'll see what I mean! How else do you imagine steampunk sounding? It just kills me how much cool and useful stuff was just left behind in those buildings. Of course, they were abandoned long before the time of the internet/CraigsList/eBay/Freecycle, but still...Pianos, awesome librarian desks, whole walls of library books? Come on! They could have at least donated that stuff to a charity. My heart breaks over those decaying buildings! If only I were a billionaire and could rescue them all! I love the photos of the abandoned buildings. I've added that web site the others you've mentioned from time to time. And I wanted to thank the person who recently posted about Dontevenreply.com. I had a week of impending deadlines and pressure but I took a break and went to that site. I laughed so hard, I had tears going down my cheeks. I Love this site. And the people who take the time to write! Thanks! 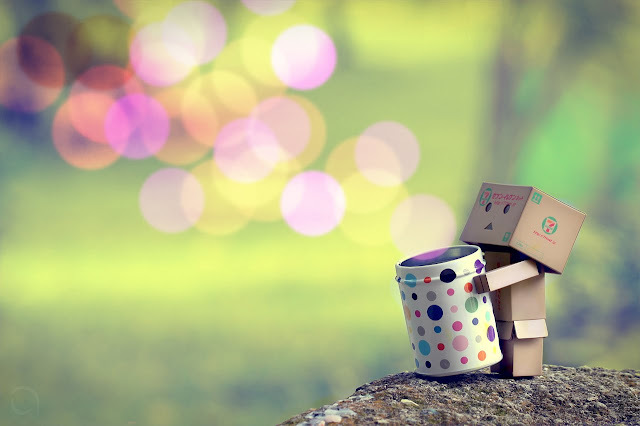 The cardboard guy is called Danbo, and he's from the manga series Yotsuba To! (or Yotsuba &, here in English, where he is translated into 'Cardbo'), it's a VERY cute and fun manga if you ever decide to pick it up. One of my favorites! Also, much love for Calvin and Hobbes and Miss Piggy! So cute! Like Sarah said above, those pictures both fascinate me and make me incredibly sad. Especially old cinema buildings. My hometown of Glasgow (Scotland) used to be well known for having many cinemas and gradually over the years they've closed down, often being demolished or completely transformed into modern apartments. My very favourite old cinema burned down a year ago and I actually cried as I saw it. So much history just gone... and we don't build anything these days that's half as beautiful and intricate as a lot of these buildings!